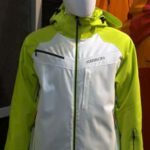 The SnowSports Industries Association brings out new products for retailers to evaluate in preparation for the 2015-2016 snow season. After scouring 250,000 square feet of exhibits and demonstrations at the SIA show in Denver last week, here are some products were technologically better than last year. Some are available now; some will be in shops late summer. 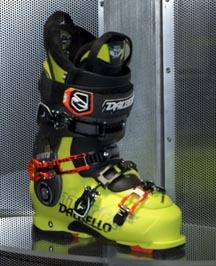 The Dalbello Panterra 120 is the trend in modern boots, with a neutral stance that works well with the modern rocker-camber skis. Add a cantable upper-cuff, infinite forward lean and walking adjustments, simple changes in ramp or foot angle and an optional Intuition foam liner and the performance bells and whistles are all playing. Snowboard boots are notoriously difficult to lace with adequate tension. With the WAXD Laces, it’s a breeze to get the boots to the desired tension even with gloves as the waxed laces slide easily but stop firmly. Every color with my favorite the rasta-pasta black/yellow. Zanier electrically heated gloves/mittens go beyond previous attempts with an easy to use control on the top of the glove with three settings, an easy recharge, and the heat lasts for up to 10 hours. 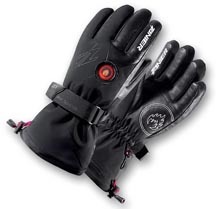 Additionally, all their gloves/mittens have extensive technical fabrics, additional insulation, and the batteries are unnoticeable in the glove. Getting kids into snowboarding without a substantial investment is now in reach with the Snow Surfer. Longer than a skateboard, it has a gripping surface for snow boots and a rope allowing the child to hang on for balance. Great to see if they like it before a complete gear-up. 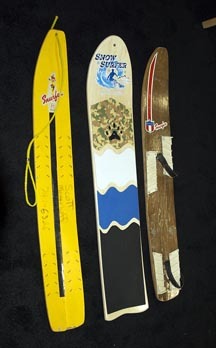 Been over ten years since you have skied? 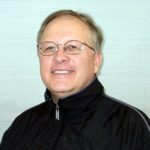 Have arthritis or a less than optimal knee that is keeping you from the sport? 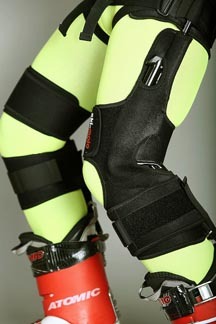 The Ski-Mojo is an exoskeleton device worn underneath ski pants which power assists the turn. It takes up to 33% of the stress off the knees while providing additional structural support. Get back into skiing and protect the knees while easing physical stress on the joint. 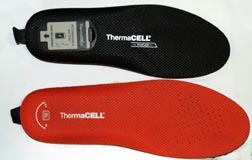 Heating ski boots or hiking boots has gone lightweight with the ThermaCell heated insoles. Just drop in the boot, and the lightweight battery provides up to 5 hours of heat with a wireless, pocket remote control. Feet can stay warm without the bulky batteries of the past attached to your boots. While a helmet and goggles are basic ski gear, they present breathing issues because of the angle of goggle pull result in skier’s nose and closing off airflow. 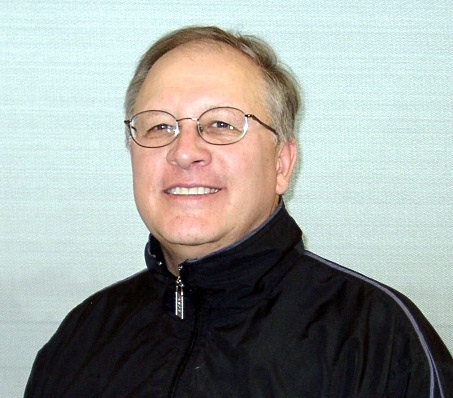 The WedgeWair (top) is a simple medical device developed by Alan Wanderer, MD, which interfaces with your helmet. 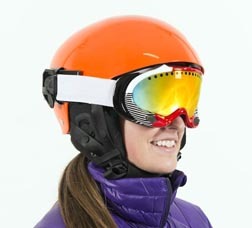 It pulls the goggles at a different angle improving breathing in cold and altitude. No more looking like the Michelin Man to stay warm with the new Karbon jackets/pants. Both the inner and outer garment stretch and Thermore T37® insulation adjusts for the need for more or less heat. 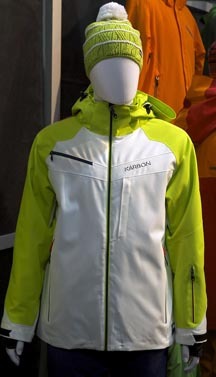 Add a water resistance rating of 10,000 mm +, and you have a close-fitting, snow-proof, warm and breathable ski outfit.